Distant View of Savendroog. Two days march from Bangalore. 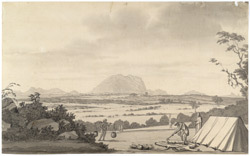 bl.uk > Online Gallery Home	> Online exhibitions	> Asia, Pacific and Africa Collections	> Distant View of Savendroog. Two days march from Bangalore. Savendroog near Bangalore comprises of an enormous mass of granite cleft in two. The fort was erected in 1543 by Samanta Raya. In 1791, Savendroog was successfully stormed by British forces under Cornwallis.